Where to start, where to start? It’s a new year, as you all know. The time where we typically try to reinvent ourselves into the better, kinder, thinner person we think we ought to be. We all know how that usually turns out. I have some wishes for this new year myself. I don’t know about you, but I think 2010 was a tough year. When I look back, I see all these high points, some new friends, some new places, I got to see my family a bit more and Prince Charming still holds my hand. Good huh? I think so. For some reason though, when I think of last year I think it was a struggle and felt relieved that it was over with. So, it is with hope and wishes that I start 2011. I hope that we are all surrounded by the ones we love, our tables are filled with smiling, happy people eating and drinking. I wish that we all look back on this year with a smile. Oh, yeah, and world peace. I want world peace. What has that to do with White Chicken Chili? Not one thing. I was faced with the first post of the new year and decided to smush them together. 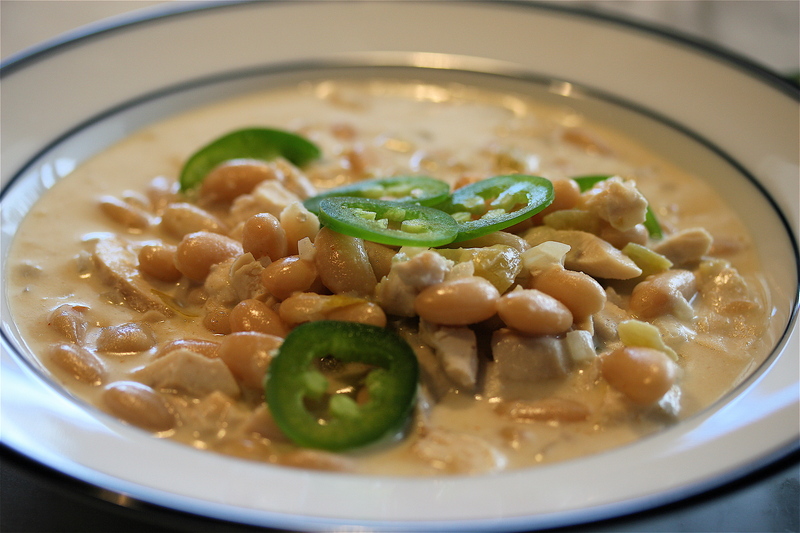 The only resemblance White Chicken Chili has to traditional red chili is the word “chili”. Red chili is in your face flavor. It can light you up like a firecracker with heat or slowly build and burn you for hours. Red chili has the time to build layers of flavors, and depending on the maker and the region, ingredients that differ as much as there are ways to put them together. Now, White Chicken Chili is a whole ‘nother thing. A distant cousin of red. A quieter, softer, more pinky finger in the air sort of cousin. Good stuff, tho’, good stuff. Yes, it’s made with cream (well, half n half) but you can get some serious heat in there if you choose, so before you turn your nose up and think it’s the wimpy stuff, give it a try. Just might surprise you. Oh, and it’s National Soup month, so I hear. Who thinks these up? So this is a New Year’s post, a regular recipe post, and a National Soup month post….nice..a triple score for sure!